Each year, the Baha’i community works with other local organizations to host a gathering to celebrate the contributions and service of women to their society. Residents of the area nominate women for an award to recognize exceptional contributions to the community. 115 women from St. Albert and the surrounding localities have been honoured to date, including this year’s honorees: Judge Cheryl Arcand-Kootenay, Helen Arnott, Felicia Blades, Carol Dickson, and Cheryl Dumont. 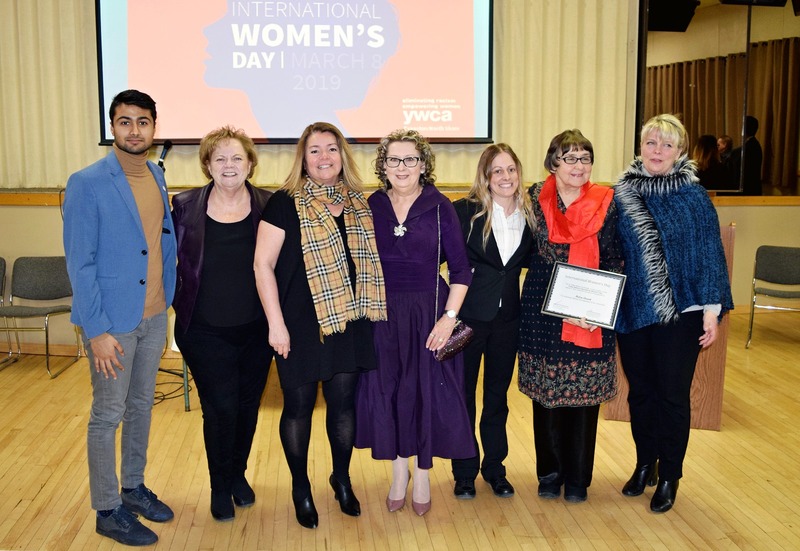 Cathy Heron, St. Albert’s Mayor, welcomed the crowd of 140 and took the evening as an opportunity to proclaim the week of March 4th – 11th as International Women’s Week in St. Albert. A representative from the United Nations Association’s Edmonton chapter, Jason Shergill, was invited to explain the 2019 U.N. theme of “Think Equal, Build Smart, innovate for change,” part of a campaign which animated this year’s International Women’s Day events worldwide. A young man and woman from the Baha’i community hosted the evening, and a young musician played the violin for those gathered. Lucille Mandin, honoured with the nomination in 2018, returned as a committee member and keynote speaker for 2019. In a talk centered on the education of girls and women, she shared an analogy, drawn from the writings of the Baha’i Faith, of humanity as a bird with two wings. In an inspiring speech, she discussed what helps us soar and what barriers prevent the bird of humanity from flying. Each year a charity is chosen to support girls and women around the world, and attendees to the event are welcomed to offer a donation to the charity instead. This year’s committee selected One! International - a humanitarian organization committed to supporting people who are in need in Mumbai, India. Local coverage of the event, with profiles of each honoree can be found here.